An echo is created, repeated and transformed over time in interplay with the space it occupies. 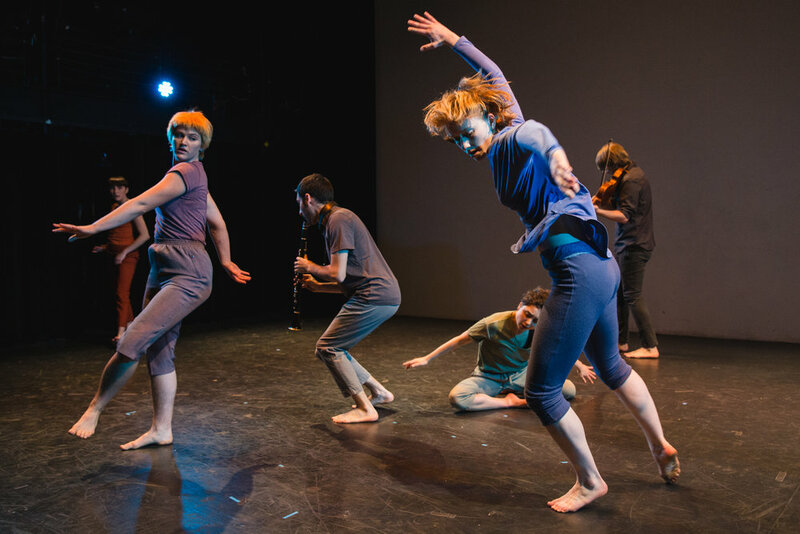 ECHOensemble creates evolving architecture of movement and sound. Together, dancers and musicians become resonant bodies, instruments of space, dissolving their mediums into one. 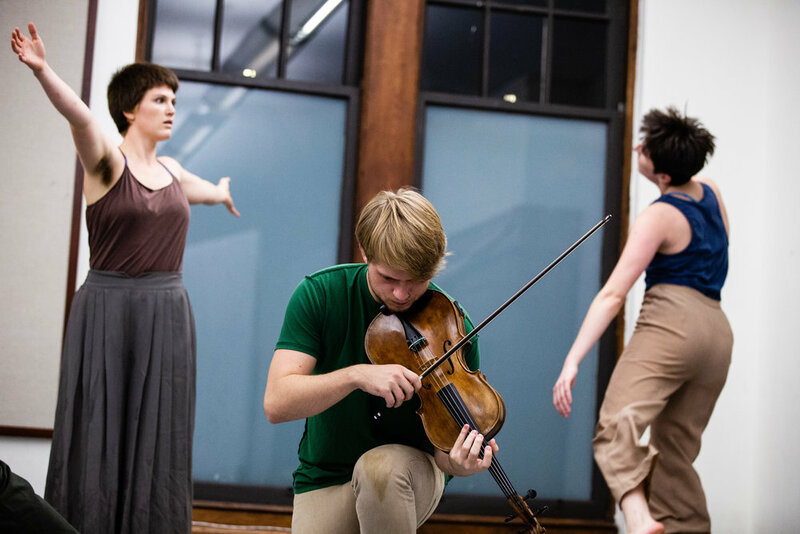 Directed by Jonah Udall, the Brooklyn-based collective comes together around an awareness-based practice called SHIFT, influenced by Steve Reich’s "process music," Mary Overlie's Viewpoints method, and two years of organic, physical research. Conversing with space and time through repetition and natural evolution, they discover shared worlds where nine singular voices ring out and blend together as one. ECHOensemble’s evening-length debut “One” premieres at Dixon Place (Manhattan) in January, 2019. Donations and non-profit funding are vital to our work, and we appreciate your support! We are a fiscally-sponsored project of the Brooklyn Arts Council and all donations are tax deductible. CLICK HERE TO DONATE! Noah Becker is a nationally- and internationally-touring alto saxophonist, clarinetist and composer. His recent projects include a research commission from the New York Public Library premiered at Lincoln Center about the modern-day relevance of the Jewish immigrant experience; and a new solo work with electronics TRUMP: An Unspoken Truth. Sean Brekke is a violist and Brooklyn native. He received his bachelor's degree from SUNY Purchase in 2016, studying viola with Daniel Farina. He has collaborated with many composers, creating new works for solo viola. Sean is a violin and viola teacher at The Brooklyn Waldorf and a violist with the String Orchestra of Brooklyn. Dani Cole is a movement artist and activist. Her work has been shown through the 92nd St. Y, Actor’s Fund Arts Center, Access Theatre, Marymount Manhattan College, and Thomas Dale High School. She has traveled to South Africa to collaborate on advocacy for decolonizing education, and is an ambassador for the Foundation for Holocaust Education Projects. Liana Kleinman is a dancer, choreographer and filmmaker from Los Angeles, CA. She dances with H.T. Chen & Dancers, ARIM Dance and Salvatore LaRussa Dance Theater. She is also a co-creator and producer of The Roof, a collaborative film and performance series featuring New York-based choreographers and composers. Erin Landers is a dancer, choreographer, and co-director of the Hudson Valley-based repertory company A-Y/dancers. Her work has been presented at the Palace of Fine Arts in San Francisco, Dance Theater Lab at Purchase College, and the Trust in Lancaster, PA. She grew up immersed in folk and social dance forms including Zimbabwean, Balkan, and Irish. Kalun Leung is a Canadian musician and composer. As a trombonist and improviser, he is a member of Little Suns, Zlatne Uste, Eco-Music Big Band, people.of.earth and So Wrong it’s Right. He creates multi-disciplinary work exploring audience interaction, social commentary, and technology, which has appeared at National Sawdust and Lincoln Center. Mary McGrath is a movement artist from the scenic Berkshires of Western Massachusetts in the small town of Lenox. 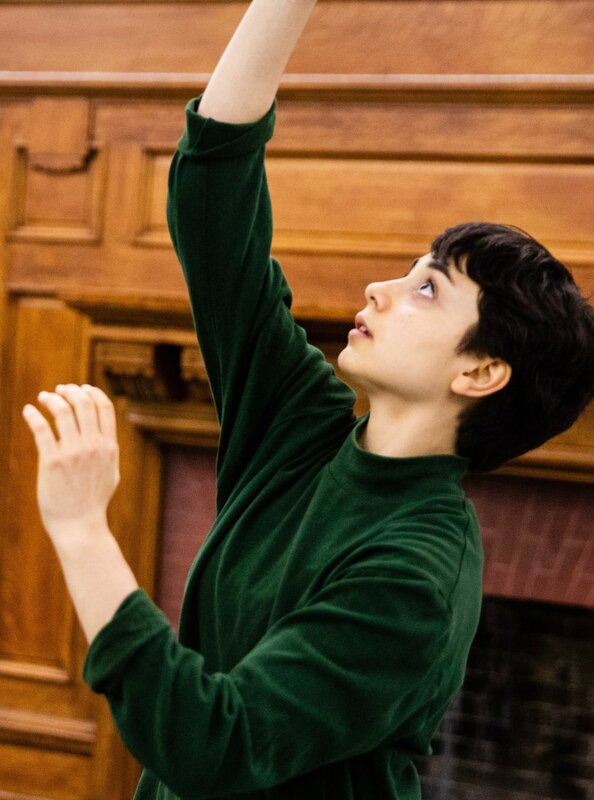 She has performed in Nick Cave’s “The Let Down” at the Park Avenue Armory, and a reconstruction of Yvonne Rainer’s “Continuous Project Altered Daily.” She is a graduate of the dance conservatory at SUNY Purchase. Allison Sexton is a queer dancer, mover and maker from the beautiful, yet problematic, state of North Carolina. She is a graduate of Marymount Manhattan College, and has studied at the American Dance Festival with Jennifer Nugent and Shayla-Vie Jenkins. You can find her running around as the Operations Manager at Gibney 890 or dancing on her roof. Jonah Udall creates work in the vast territory between improvisation and composition. As a guitarist and director, he seeks new acoustic sounds, explores repetition as humanism, and borrows ideas from unexpected, mundane sources. He tours internationally with the chamber-jazz trio Sound Underground. His collaborations with movement artists have included commissions for a Merce Cunningham MinEvent, The Roof video series, and Triskelion Arts' Never Before, Never Again festival. Jonah grew up in Berkeley, California, steeped in folk musics from around the world.